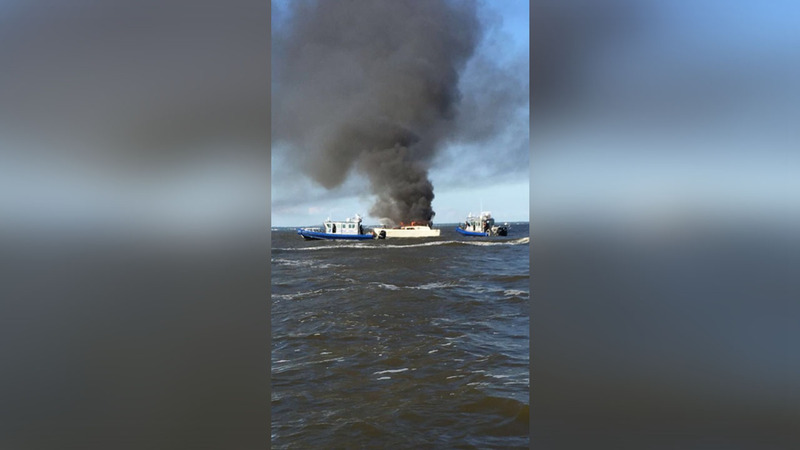 GREAT SOUTH BAY, Long Island (WABC) -- Suffolk County Police Marine Bureau officers responded to a boat fire on Tuesday night at Barrett Beach in the Great South Bay. A man and wife along with their two dogs were leaving from Barrett Beach, just east of Fire Island Pines when their approximately 30-foot-boat started heating up. The 41-year-old man, and 45-year-old woman, both of Newburgh New York jumped into the water, along with their two dogs. The couple had life-jackets on and put a life-jacket onto their two dogs. A 70-year-old Lindenhurst man saw the victims in the water and brought them onto his approximately 38-foot Tiara boat. The victims were in the water for approximately 10-15 minutes. There were no injuries. Officers Dale Kelly and Chris Schnoor of Marine Bureau boat Marine Kilo responded and attempted to extinguish the fire. Officer Rob Reed and Officer Andy Diviney of Marine Bureau boat Marine Juliet assisted. The officers put out most of the fire when members of the Sayville and Haggerman Fire Department responded. The boat eventually sank.